Sky and Publicis Italia came up with a viral campaign against spoiler before the launch of the third season of Gomorra. The idea is simple: the main characters of the serie belonging to different clans team up together to fight spoilers. We designed an experience for both desktop and mobile where users can select one of their favourite character to send a warning message and, with few quick easy steps, jump on one of the video specially shot where the characters threateningly “invite” people to not spoil tv series. All the website has been developed with both attention on cool effects such as parallax, animations and transitions and a smooth experience optimized for all the latest devices. All the contents (video, cinemagraphs and photos) have been shot with the actors specially for the Spoiler Killer project. We also produced all the sound fx to enhance the experience. 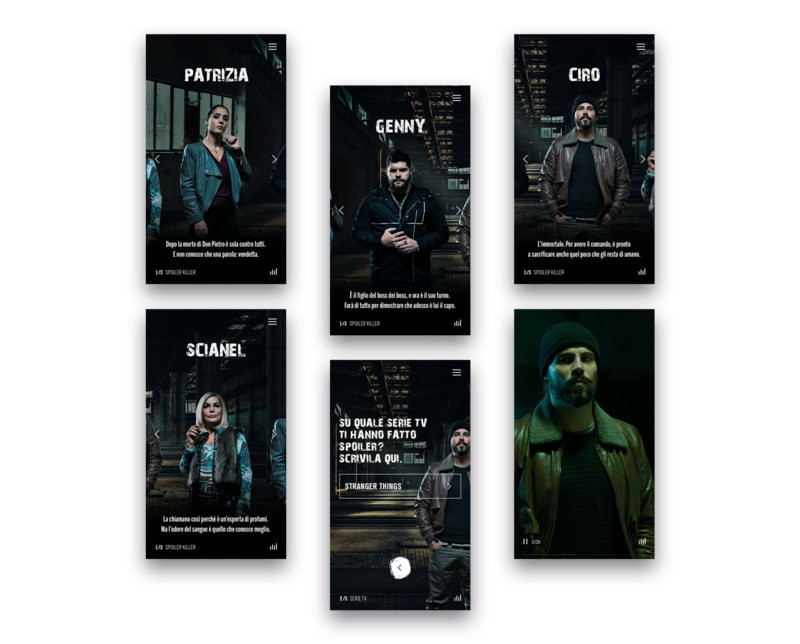 The result is an engaging experience where fans of the serie can easily recognize the Gomorra world, choose their favourite series and share on social media to let their friends know to spoil at their own risk. The project was really successful collecting thousands of shares across social media.